Norma A. (Borselli) Pecora, 90, longtime resident of Woburn passed away peacefully Monday February 4th at the Winchester Hospital with her family and friends by her side. She was the beloved wife of the late John M. Pecora who died August 31, 1992. Born in Boston Norma was the youngest of six children born to the late Joseph and Josephine (Minichiello) Borselli. At a young age her family moved to the Winnmere section of Burlington. She attended Saint Charles School and her family later moved up Winn Street into Woburn where she meet John Pecora who was returning from the Navy. They married in 1947. For many years Norma was a full-time homemaker while raising two boys and caring for her mother. Her biggest passion and gift was hosting dinners and family gatherings at her home holidays where always a special time. 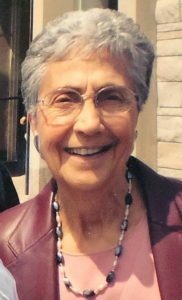 For many years, Norma’s family enjoyed her culinary skills and passion for Italian cooking, a skill that she enjoyed passing on to the next generation. Norma enjoyed golfing and traveling with her husband John throughout the United States and many Caribbean Islands. Her trip to Italy was her most memorable. Jerry and I send you our sincerest condolences and deepest sympathies at the loss of your mom. Sorry to hear of your loss, sending my sympathies. Sorry to hear about your mom. They don’t make them like that anymore. May she Rest In Peace. Aunt Norma was beautiful inside and out. As my godparents, she and Uncle John will always have a special place in my heart. May she rest in peace. Our deepest sympathy for your cherished loss. Norma was a great influence in all of our lives. She will be deeply missed. May she rest in peace, joining her big beautiful family in God’s loving arms. Sincere condolences John to you and your family, may she rest in peace. My deepest sympathy to the entire Pecora family. May her soul rest in peace.